Great to read about he picture returning to where it belongs. Query though how long before our Labour government decide to sell it to improve the fiscal situation. Hampton Court has some of the best gardens I've ever seen. Also, a really enjoyable tour of the Palace. Some years ago there was a television documentary on the restoration of one of the small sunken formal gardens. That's exactly how I remember it. We've been there in May and June and the gardens were just magnificent. They even held up being viewed the day after going to the Chelsea Flower show. Quite a magnificent position and have flashy. Gardens, too, I think. At the time I was wondering who was the host. In addition to the sunken garden there were long deep perennial borders in several other spots. Is my memory failing me, or is Hampton Court not home of The Vyne? I wish that royal events could be held at Hampton Court. It is a very beautiful and majestic building with so much more history(a much older history than Buckingham Palace). All I can remember is some event being held in 1995 in relation to CP Pavlos's wedding to then Marie-Chantal Miller(CPss Pavlos(Marie-Chantal)of Greece. I am also glad that portrait of Pss Mary was returned to Hampton Court where it belongs. I hope it stays there and never leaves Hampton Court nor the country ever. I believe CP Pavlos and MC Miller had their wedding reception at Hampton Court Palace. They decorated it with a regal Greek theme. There are some photos of members of the bridal party in one of the courtyards. I've read that even non-blue bloods can hold receptions there. I'd imagine it's quite expensive. I've also heard companies can rent out space for their functions, but I'm not sure about that. Twenty-first century technology is enabling visitors to Hampton Court to view one of Henry VIII's tapestries in its "dazzling" original colours. 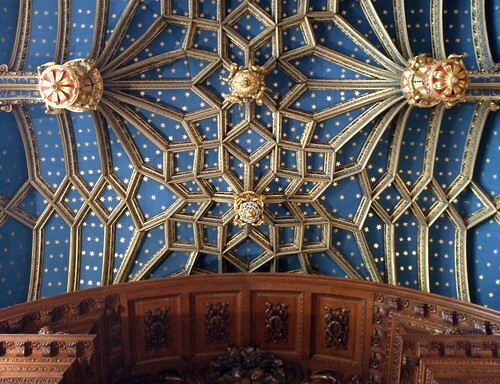 Courtesy of Royal palaces-Hampton Court Palace Official website. "Courtesy of Oxford Archaelogy: exploring the human journey." Hopefully, there shall be photos inside the chapel, the Great Hall, other inside areas of Hampton Court Palace and also in the various gardens. Courtesy of The Bishop of London's official website. "The Bishop of London-Richard John Carew Chartres." It's a very historic chapel as well. Henry VIII married Catherine Parr his last wife there married on 12 July 1543 and his son Edward VI was baptised in the Chapel on 15 October 1537. I visited Hampton Court 4 years ago and I remarked at the time to the people I was with that I was surprised the Royals didn't use it more for weddings as unlike some of the other chapels within the Royal Palaces it is actually quite big and very beautiful, like a smaller version of St. Georges at Windsor in many ways. Wedding packages available to ordinary people at HC only seem to offer the use of some peripheral parts of the palace and not rooms within the main body of the building which were used by Prince Pavlos. The Chapel Royal is also not available for use. Where dose Hampton Court Palace get its name why not just Hampton Palace also didnt the Tsars sister live there???? Not according to the website, its also not been lived in since the 18th Century, by Royals I mean. I think it became Hampton Court Palace when King Henry took and interest. Before it was just Hampton Court. The Grand Duchess Xenia did not live in the Palace proper, but she did live at Wilderness House, a 'grace & favour' residence, which is in the grounds of Hampton Court.